I have noted a tendency in myself to react to every and any event by saying “God must will this” or “Everything happens for a reason.” By “any event” I mean everything from being diagnosed with bipolar disorder to whether my bus comes on time. Absolutely everything. Yet I have some problems with the idea that God decides every single action that I or anyone else takes, some for fancy theological reasons and some because it becomes difficult to function in life when I think like that. 1. 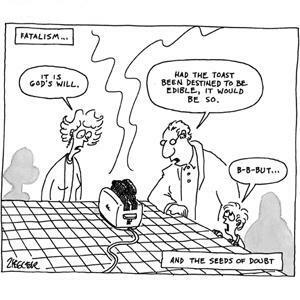 The belief in fatality; the doctrine that all things are determined by fate; a particular form of this doctrine. 2. Acquiescence in the decree of fate; submission to everything that happens as inevitable. When I’ve been depressed, I’ve often ended up thinking “horrible things are always going to happen to me, everyone is going to hate me, there is nothing I can do about it.” This particularly takes the form for me of saying “I am always going to be ill, nothing I can say or do or take will ever make me well again, I am just useless and I should die because nothing will ever get better.” I’m sure I’m not the first person to think like that when I’ve been ill, and there is a religious equivalent of this, too. “Fate,” of course, refers to the “three goddesses supposed to determine the course of human life (Greek Μοῖραι, Latin Parcæ, Fata).In Greek the three Fates are called Clotho, Lachesis, and Atropos.” (OED) Similar figures occur in other mythologies. The belief that events are predetermined from eternity is common across the world, another example would be the Norse goddesses the Norns. Christians, too, sometimes believe in fate – that God ordains from beyond time all our lives. I find Calvinistic teachings rather attractive, because they are very logical, they are usually well-argued and I like the TULIP points. TULIP stands for total depravity, unconditional election, limited atonement, irresistible grace and perseverance of the saints. For more on this, the Calvinist Corner website has a page on it. How then can we say that God decided we should suffer (whether illness or anything else) and yet wishes good for us? Arminianism is “a school of thought which believes that God created people and angels with free will, though God eternally foreknows what they will do. In this view, everything happens for a reason because God allows everything to unfold exactly as it does.” So, God knows what will happen but does not interfere, and does not stop evil because the importance of free will is paramount. Thus, I am ill not because God wishes me to be bipolar, but because he has allowed this to happen. I am probably ill because of genetics, or brain chemistry, and while God could have stopped that happening, the free will which in Adam and Eve led to sin in the world, and the broken nature of creation, means that he will not take away the consequences of that sin, even though it means that in the here and now I suffer for no good reason I can think of. Not God’s will – but the free will of man affects us most of the time, although God can and does intervene when he so chooses. He does, however, promise to bring good things from the evil that happens. Gregory Boyd, writing in a post called Randomness and Assurance puts a third way into the mix when he says that God has a plan, a purpose, but that mankind has free will and can reject that plan. Because we have free will, if we choose to act in a way God does not want us to he cannot prevent it even when evil God hates is the result. Boyd says that God cannot stop it, because if he did we would not have true free will. If a person is prevented from freely choosing evil, then that person does not have free will, God cannot give free will and then force a particular choice otherwise it cannot be free will. To me this perspective seems pretty similar to the Arminian one, but I’d advise reading the link for yourselves because I am not too good at explaining this sort of thing! Getting back to my original point – having a tendency to assume God micro-manages the universe, that everything in my life, good, bad and indifferent is chosen by God is not something I agree with. It is very tempting to adhere to, partly because it removes any responsibility I have for my actions and events that happen in my life. If God wills directly whether I get this or that job, then I don’t really need to make an effort at interview, because God has already decided and I cannot change anything. Likewise if I am feeling suicidal because I am depressed, I might as well go ahead because God has already decided if I will die this way, and if I succeed it is because he wants me to. And of course, he also decided I would be depressed in the first place! I believe that God brings good things out of bad things that happen to us, as I have written before. I don’t, in my heart of hearts, believe that God decided to give me bipolar disorder, nor that he decided anything else bad in my life should happen. I do believe that he has good plans for me, but I also think that I might not know until I see him face to face what good he has brought from evil, what his plan for my good was. I do think there is a purpose, that God has a plan, but I absolutely believe that we are responsible for our own actions, and that our actions (and those of our ancestors) have an effect on other people that is not God’s fault. The Calvin-influenced preacher Charles Finney once wrote “A state of mind that sees God in everything is evidence of growth in grace and a thankful heart.” I would temper that with, we should always give thanks, for we are told to “give thanks in all circumstances; for this is God’s will for you in Christ Jesus.” (1 Thessalonians 5:18) We should have God in our minds, and in our hearts when we look around us, but I don’t think that every decision has been pre-made by God, and I am trying to break the habit of fatalism in myself. Excuse my foray into theology, I don’t normally do it!